Steve Bader outside CTI. Photo by Katie Harris. 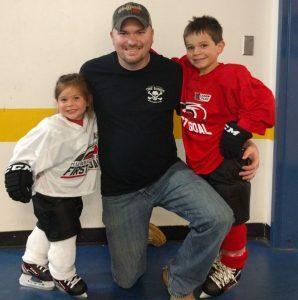 Stephen “Steve” Bader was born and raised in Fort Lauderdale, Florida, where he spent a lot of his time playing pickup games of street hockey with his friends. He and his family moved when he turned 16, and they bid the beach farewell and met the mountains of Franklin, North Carolina. 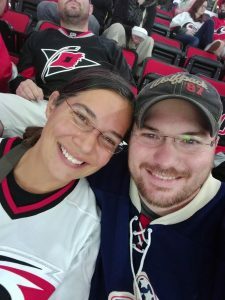 After high school, he joined the 2+2 Engineering Program and completed his first two years of college at UNC Asheville where he took distance education courses through Engineering Online before officially transferring to NC State. He graduated with a Bachelor of Science degree in mechanical engineering with a minor in computer programming. 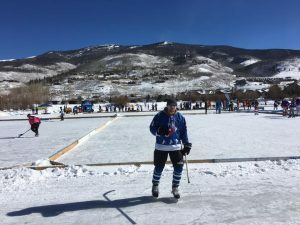 Steve playing pond hockey in Colorado. In 2012, Bader was hired as a PHP web developer and a Moodle lead for DELTA. 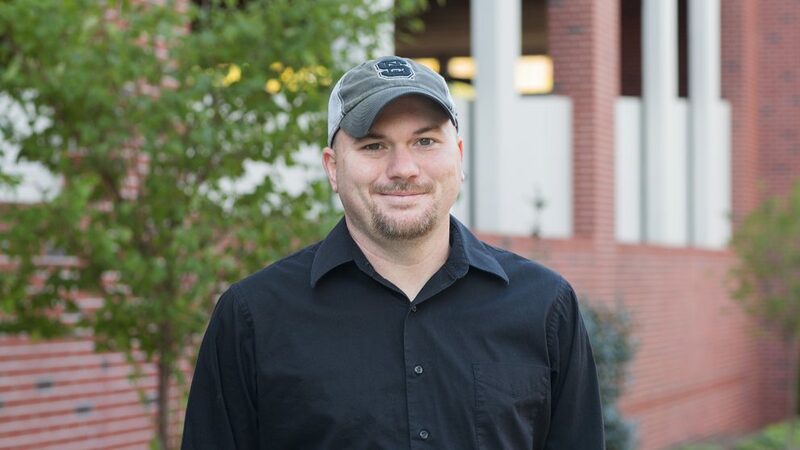 When Bader first began as a distance education student, little did he know that years later he would be working on technologies to enhance online and distance education. He has to be prepared to identify and resolve any issues or bugs in Moodle and any of its plugins like Zoom and Turnitin. “I’m on tier three support, which just means I deal with the more severe issues. Basically, if the issue gets all the way to me, there’s a bigger problem. It’s my job to figure out what that problem is for the faculty,” explained Bader. Because Moodle is an open-source learning management system, Bader and his team are able to customize and tailor it to NC State users, in addition to debugging code and sending it back to the Moodle community. “Since it’s open source, we have the ability to fix or improve the installation. Our team specifically has contributed enough that we’re recognized in the Moodle community,” he said. “I’ve worked on a lot of fun projects. I helped develop Trot to Trophy, which is the equine science mobile game. It ended up being a great learning experience because after building it, we realized the application couldn’t be translated for future courses. That’s what inspired us to build the gamficiation module which can apply to multiple courses, therefore benefitting more people,” he added. The gamification module created by Bader and the DELTA team is one of the major contributions that we plan to make available to Moodle users around the world. “I’d have to say my favorite project, though, is being the Moodle maintainer. Moodle is just a beast. It’s the largest application I’ve ever worked on, and I still haven’t been to all of the corners of it,” said Bader. He even recalls his first experience with it. “Before my interview with DELTA, they told me I’d be working with Moodle, so I downloaded it and was shocked by its size. My first confession in the interview was that I’ve never worked with Moodle before,” he explained. Bader knew familiarizing himself with Moodle was not going to be easy, but he has dedicated himself to learning the ins and outs of it. “There’s still plenty to explore with Moodle, but I really do enjoy working with it,” he said. Not only does he spot and resolve problems on the application, but he also constantly explores ways to improve it. 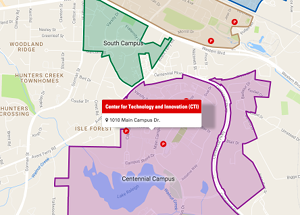 “NC State is one of the largest installs, so we identify performance issues that occur due to sheer size that Moodle often misses,” said Bader. “It’s the ownership, responsibility and trust I’ve been given with the Moodle installation. It means a lot to be able to make independent decisions and know the team believes in me and my abilities to do so,” he said. He also loves a challenge. “Since we have such a massive amount of Moodle users at State, it’s crucial that we make sure it’s reliable. We love the challenge of keeping it up and running, without issues. Aside from scheduled maintenance, I don’t think we’ve ever been down and we’d like to keep it that way for as long as we can,” he added. Steve and his family — Addison, Krista and Ryan. Photo by Deana Smith Photography. “My spare time is entirely filled with family and hockey,” said Bader. Bader and his wife, Krista, met while they were both undergraduates at NC State. She graduated from the College of Humanities and Social Sciences with a degree in psychology. 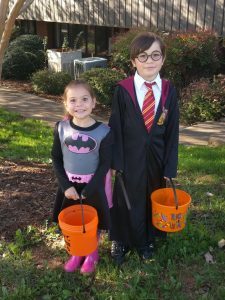 They have an 8-year-old son named Ryan and a 5-year-old daughter named Addison. 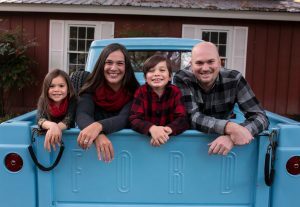 “Krista worked for a few years as a qualified professional for children with special needs, but once our kids got older she transitioned into a stay-at-home mom so she could homeschool them. She’s done an absolutely amazing job,” added Bader. Steve and kids — Addison and Ryan. Whether it’s studying or skating, their family is always in it together. In addition to playing hockey himself, Bader coaches Ryan’s 8U team, Addison attends hockey camps and Krista cheers them on from the stands. “She’s a true hockey mom. She’s bundled up in her blanket at every game, no matter what. Without her, none of this would be possible,” he said. Recently, Krista also coached Addison’s first full season of soccer. “Addison did amazing, they had an awesome season,” Bader added. 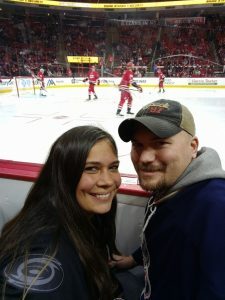 His family also has season tickets to the Carolina Hurricanes and Wolfpack football games where they tailgate with DELTA friends. What’s something people may not readily know about you? “Well, I go to the MoodleMoot conference every year which is always interesting. This year was especially exciting because we got to go to Denver,” said Bader. He’s no stranger to Denver. His love for hockey led him there last February where he played pond hockey with a group of friends for the first time. “I had never played pond hockey before, but it was pretty insane. Before each game started, the officials drove a zamboni out on the ice to prepare it so I figured if it could hold up that much weight, then it would be safe enough for us to skate on. The ice was about 16 inches, so it was definitely thick,” he added. 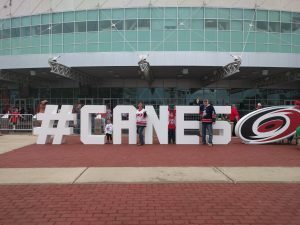 His trip to Denver definitely stands out as one of his favorite hockey memories, but another one that stands out is a bit more recent. 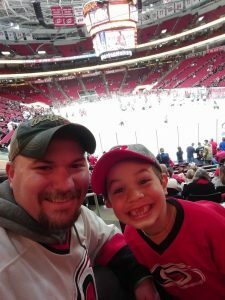 “Ryan is an amazing hockey player, especially for his age. In his last game, he really wanted to get a hat trick, which is three goals in one game. About halfway through it, he scored his third goal and then with a few minutes left, he scored a fourth one. I don’t know if there’s a word for four goals, but it was so cool to watch him play like that,” said Bader. Hockey-related or not, the experiences and memories Bader has shared with his family are what he cherishes the most. He could not be more excited to see what the future holds for them all.